After earning degrees in Animal Sciences (B.S. Honors) from Delhi University (India) and M.S. 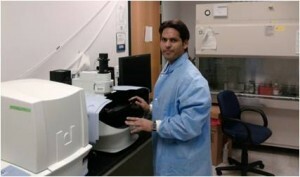 in Biotechnology, Vinay experienced research techniques involved in screening of potent anti-cancer drugs (Cycloheximide, Gallic acid) and their encapsulation in Polymeric Nanoparticles (Gelatin) from NanoBiotech lab (Delhi University, India). Then he served Department of Biotechnology, G.V.M Girls College (India) as a regular faculty (lecturer) teaching core subjects in Biotechnology and Bioinformatics at under-graduate level, also carrying on his research activities involved in Nanoparticulate targeted drug delivery for cancer. After the 2 yrs of rigorous research and teaching experience he was invited to FIU, BME department as a Visiting Research Scholar and is currently a part of the lab as PhD student.